You deserve to have the best looking smile possible. At the Dental Centre, we are continuing to move forward to help our clients look their absolute best, and we are pleased to announce that we are an exclusive carrier of GLO professional at-home teeth whitening systems. 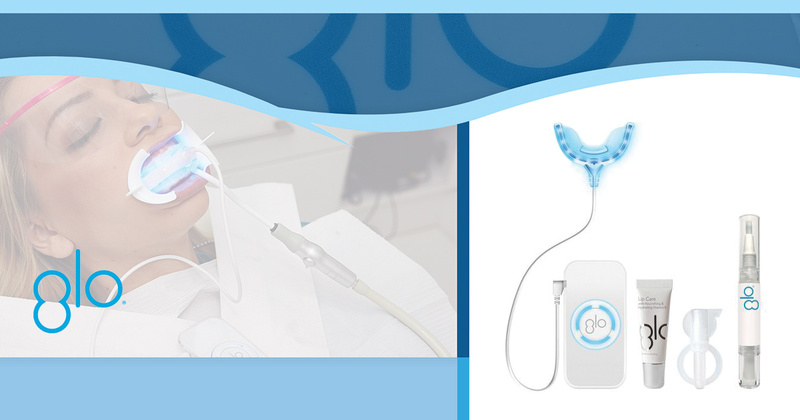 The GLO system is a revolutionary step forward in teeth whitening technology, providing you with professional-grade teeth whitening in the convenience of your own home, on your own time. GLO is a revolutionary at-home teeth whitening system that is clinically proven to whiten your teeth by five shades in as few as five days. The catch? There isn’t one. While other teeth whitening systems leave your teeth feeling sensitive and uncomfortable, GLO offers effective, faster and longer lasting teeth whitening with little to no sensitivity. GLO is an acronym for Guided Light Optic. This at-home teeth whitening system uses optic technology to effectively whiten your teeth. The process is very simple. Place the GLO control around your neck and attach the mouthpiece to the controller. Apply lip balm to your lips to ensure limited discomfort and sensitivity. Next, apply the whitening gel to front sides of both top and bottom rows of your teeth. Activate the GLO whitening system using the button on the controller. 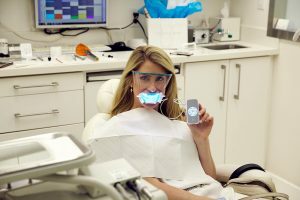 Each whitening session is just eight minutes, a span of time that can be spent doing anything from chores to checking email to reading a book. The GLO whitening system shuts off automatically after eight minutes, after which you simply spit out excess saliva, Rinse out the mouthpiece, and that’s it! Doing this just four times a day will provide you with whiter and brighter teeth in as little as five days. This is known as the GLO difference. Where Can I Get GLO? The Dental Centre is a GLO Certified practice. We are proud to offer GLO at-home teeth whitening systems at all of our Ontario locations. Uxbridge, Stouffville, Sunderland, and North PortDental Centre patrons can now experience the convenience and proven results of the GLO at home teeth whitening system. At the Dental Centre, we are committed to providing our clients with the absolute best in dentistry services. Continuing to move forward with the breakthroughs in dental technology, we are pleased to offer our clients this highly effective and revolutionary teeth whitening system. To find out more information about the GLO whitening system, or to contact one of our Ontario dentist offices, get in touch with us today! ©2016 The Dental Centre® - All rights reserved.